I count myself lucky to find myself on the list to see shows at Santa Monica's City Garage, where theatre routinely eschews the naturalistic for the ritual, the realism of cinema in favor of the dream made flesh. Carmen Disruption by Simon Stephens, makes for an excellent example of this. 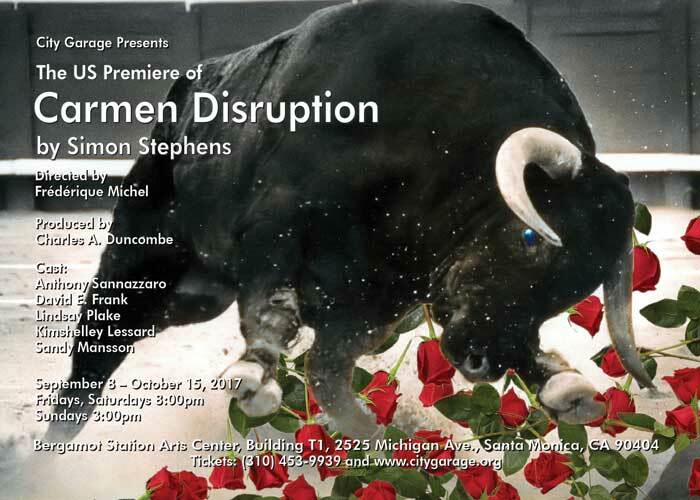 The play takes as its template Bizet's Carmen, with a Performer (Kimshelley Lassard) coming to some unnamed city to play the title character in a production there. But she feels an increasing loss of identity, traveling over and over again to play the same role. In between snippets of song, she begins asking questions about her own name, where in fact she is right now, has she been here before, where does she live? Her own identity seems dissolving in a modern world with easy travel and mass communication, but lacking...what? Likewise she notes how the same people seem wandering into her view, different individuals but somehow ever and ever the same characters as those in Carmen. There's Carmen (Anthony Sannazarro) a charming gay hustler hurt and lost, someone who clearly sees himself as inherently desirable, eager for pleasure, in control -- yet subtly fragile, simply waiting to become a victim. And Michaela (Lindsay Plake), a depressed young woman contemplating suicide after her boyfriend left her. Why did he do this? Well, that in a way is what all her contemplations and words focus upon, coming up with one answer after another, each different and pretty much none of them mutually exclusive. Don Jose (Sandy Mansson) is a taxi driver, frightened then frighteningly obsessed by her abandoned son, finding in such obsession a kind of joy and purpose. Then there's Escamillo (David E. Frank), a famous bull fighter in the original but here a not-very-honest futures trader finding himself on the edge of a emotional precipice, without understanding why. Each of course echoes the characters in Bizet's classic, demonstrating with an old fashioned form of media (opera) how modern media (their mutual endless checking their iphones and the like) isolate themselves from the rest of the world. Not necessarily because of media! That merely stirs up what is already there. At least, for example, Michaela proves able to connect to others for example. She in fact seems the strongest of them all by the end, perhaps having met her demons head on in a way the others have not. On the opposite end, the Performer seems at the end to simply lose all perception of the world. The other three all seem to be on roads that could easily spell personal disaster on many levels. Or so it seems. In truth, for the vast majority of the show (nearly two hours) characters speak not to anyone specific but rather to the audience, making us utterly passive members of the cast. Passive because we don't get to tell our tales, nor ask any questions nor offer one word to these five people who keep spewing their souls in front of us. Are these people us, in the same way they are in a quite real manner their counterparts in Carmen? Such ends up as the challenge facing we the audience, a subtle but deep interaction -- providing we listen hard enough. Which seems rather the point. Carmen Disruption plays Fridays and Saturdays at 8pm, Sundays at 3pm (pay what you can, at the door) through October 15, 2017, at the City Garage, Bergomot Station Arts Center, T1, 2525 Michigan, Santa Monica CA 90404. 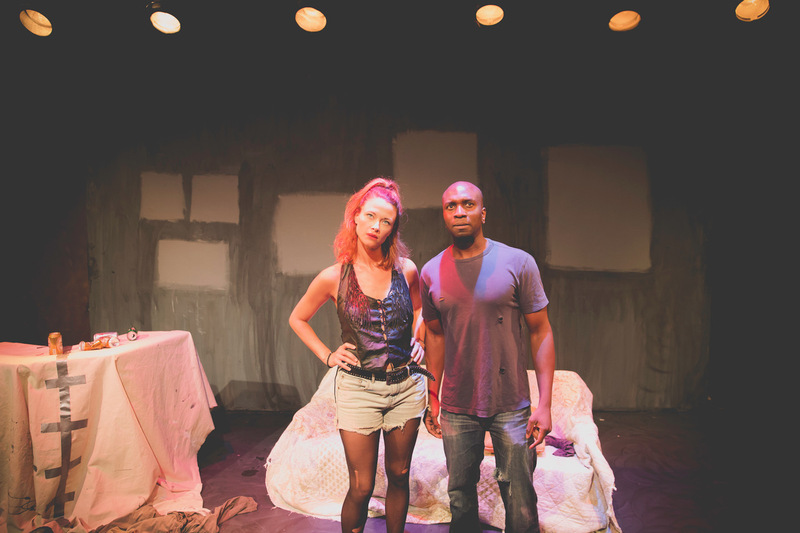 NOTE: This play has been extended and moved to a different venue--starting Oct. 6 thru Oct. 29, The Dreamer Examines His Pillow will show Fridays & Saturdays at 8pm, Sundays at 7pm at the Hudson Mainstage, 6539 Santa Monica Blvd. Three people. A man. His sometimes girlfriend. That sometimes girlfriend's father, an artist. Circumstances give all three an chance to genuinely examine their lives, to reach some kind of epiphany about what they are going to do about themselves and each other. Sounds simple. Maybe pretentious. Perhaps profound. Ultimately it all depends on execution. The Dream Examines His Pillow is an early play by John Patrick Shanley. I saw one of the original productions of it back in the 1980s in New York City. After all this time, much of it sticks with me. This production, in Hollywood for one more weekend as I write this, succeeds on far more levels than the New York one. Thirty years ago I enjoyed the play. This time I felt transformed. 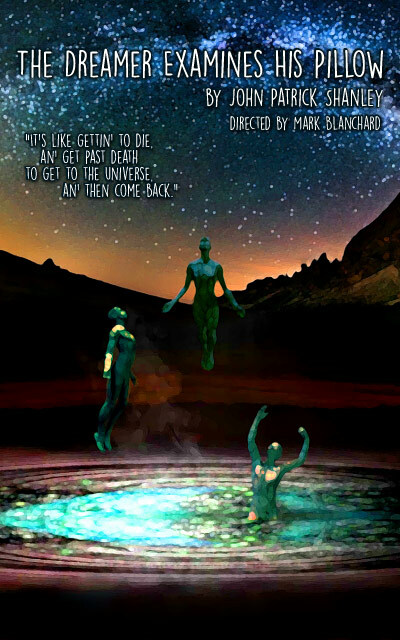 Walking into the theatre feeling depressed, within ten minutes I felt totally absorbed in these characters and their words, losing myself in contemplating their paradoxes, their revelations. What more is theatre supposed to do, honestly? Tommy (Ade M'Cormack) and Donna (Scottie Thompson) broke up some time ago, not least because of how they hurt each other. Yet they give each other ecstasy as well. They touch each other in so many ways, in so many places, they find each other addictive and terrifying at the same time. One particularly powerful encounter in Tommy's rat's nest of an apartment leads Donna to go see her estranged Dad (Sal Landi). She's trying to make sense of her life, of what she now fears is a shape determined by her parents. Is she reliving her mother's terrible marriage, an echo of someone else rather than herself? Her father turns out to have some startling revelations of his own, ones that shock her to the core. More, they stir up the seas of his own deepest soul. This should come out ridiculous. Honestly, in New York, parts of it did. At least two of the actors then fell into some traps. They didn't know exactly what they were saying. Bad mistake. They whined instead of talked or demanded or revealed. Worse mistake. Not this cast! No! They understood and meant every single nuance of every syllable. Which honestly is almost the only way to care at all about what is going on. 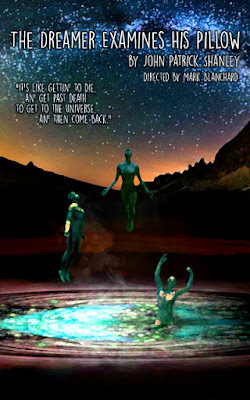 Because the subject and plot of the play focuses on what is genuinely a religious experience--or at least what we call that because we don't have another word for it. Each individual has a revelation, or a series of revelations, from a variety of different sources although ultimately themselves and each other. And that kind of revelation, what we learn from it--there are no words. We have to make some up, or arrange the words we know in some way that almost recreates some vague sense of what we've learned. Director Mark Blanchard clearly understood all this, working hard with the cast to nail down what is actually going on here. Not just a young man trying to figure out why he does terrible things, or a young woman finding out the bone-jarring truth about the relationship between her parents. Yeah, those are there but remain symptoms or at best examples. What are we going to with our lives? What have we got to learn? How are we going to find out what we have got to learn? 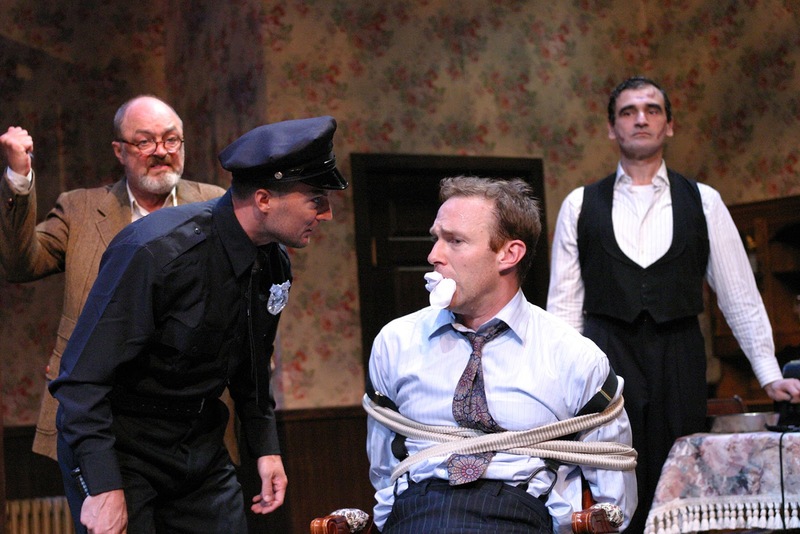 Fundamental questions, and this play tackles them head-on, then the cast tackles them again. In turn therefore we the audience follow suit. Yeah, what else is theatre FOR?????? The Dreamer Examines His Pillow plays Friday and Saturday at 8pm and Sunday at 3pm until September 24, 2017 at the Lounge Theatre, 6201 Santa Monica Blvd (one block east of Vine), Los Angeles CA 90038. 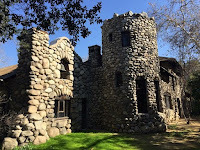 Macbeth at the Lummis House marks one of several events all year long sponsored by the Shakespeare Center of Los Angeles, celebrating/exploring the play which seems to be especially "on target" this year. Yes, this is about the election one way or another. This and Julius Caesar are seeing a lot of new (sometimes controversial) productions right now. This slightly gets into this show's biggest challenge--namely of comparison. Within the last twelve months I've seen several Macbeths, including two of the very best I have ever seen at all. Which is unfair to this production. 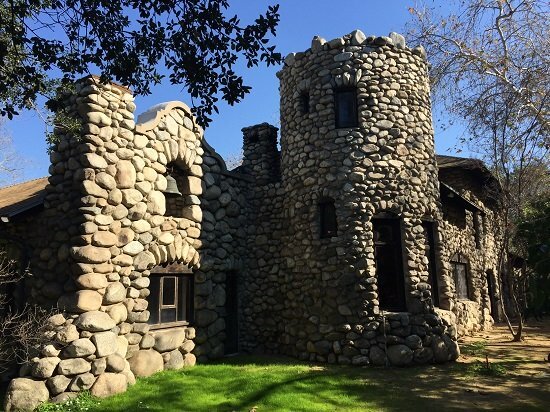 Lummis House, not unimportantly, is a virtual castle built in Glendale by the same man who pretty much created the Southwest Museum nearby. It looks amazing and frankly should become a regular site of Shakespeare performances in the future. I hope it does! This specific production is on the lean side of a what is after all fairly short play, so there's no intermission. All the better! You feel sucked into the world and events without a break! Probably the single biggest strength of this production is how totally and seemingly effortlessly the cast understands every single word they say, conveying that meaning. Anyone who has suffered through performances by performers who didn't know that, but just spake forsoothly in a vaguely Elizabethanesque mood will probably sympathize. None of that here! From the first line to the second, the cast understood and so we the audience understood. In general the text's editing accomplished everything it set out to do, which is also a good thing! Very good! 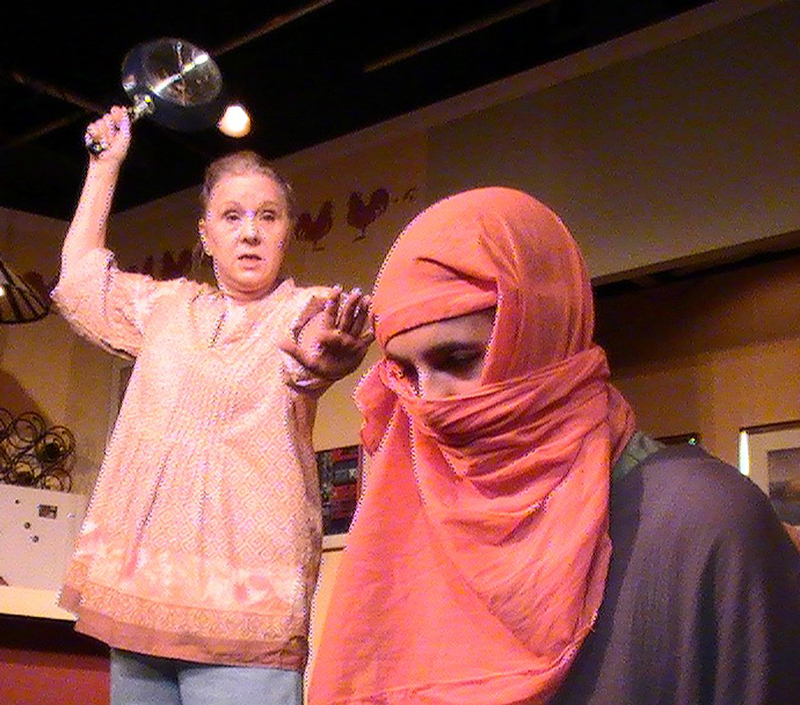 Rarely have I felt so the horror of Lady Macduff (Ashlee Dutson) as she realized her doom had arrived. Even the Witches (Dutson with Camille van Putten and Lynn Favin) clearly had a relationship with the rest of the world, not just each other. We even got a hint of what they are when "apart," i.e. medieval women in a brutal society. The couple at the heart of the story were done in a fairly traditional sense, with the Thane of Glamis as a man of mixed feelings unequal to temptation, his Lady a dangerous and ruthless woman pushing him to an evil greatness. Macduff (Fabian Cook Jr.) proved one of the very strongest performers, so much he carried off a lovely interaction at the very end with the Witches, without uttering a word. 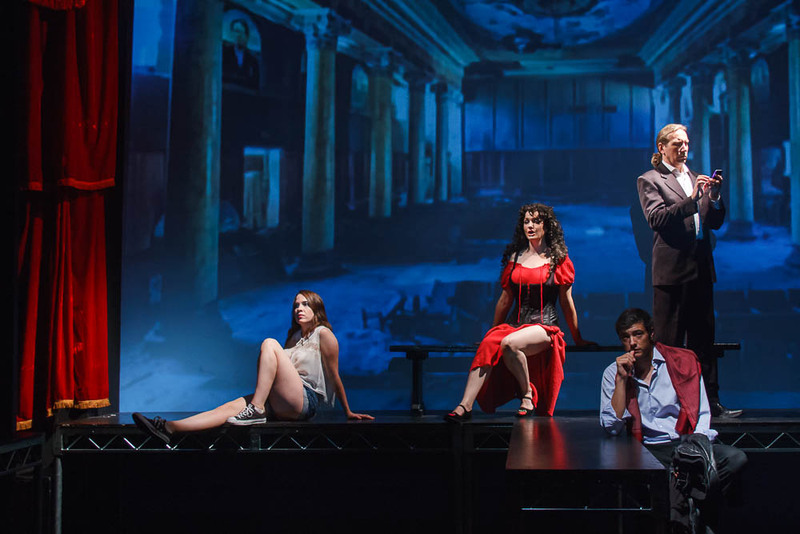 This Macbeth I understand will be part of the Macbeth Haunted House at the Shakespeare Center for October, which seems to me an excellent choice given how vividly clear and precise the heart of this production is and presumably will remain. 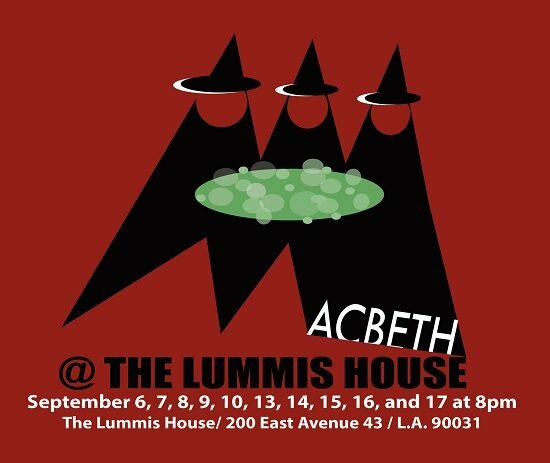 As for now, Macbeth at the Lummis House plays for FREE at 8pm on , Thursdays, Friday, Saturday and Sunday until September 17, 2017 at The Lummis House 200 East Avenue 43, Los Angeles CA 90031. I've only seen one other show by the Crown City Theatre in NoHo, i.e. Nosferatu at this year's Fringe. I quite like that! Was thrilled to get an invite to see something else by them! But now here's a quandry. There remains a great deal to like about this production. Here I can mention the sound design, the set, the costumes, etc. which were all very good, very realistic and frankly sometimes done with a very nice elan. Comes across as damning with faint praise, though. 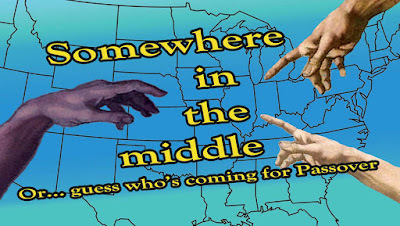 Somewhere in the Middle (or...Guess Who's Coming for Passover) deserves more! For one thing--and here is no small matter--the actors showed considerable talent and stage presence throughout. Nobody shone above the others, which means no one shrank in believability. More, everyone involved brought their characters to genuine life, made me care sooner or later, certainly came across as very nice folks whom I would enjoy as neighbors. That doesn't make for good theatre, though. The script has a lot going for it. I don't really care for polemics, which this is, but at least this one doesn't try and tell everyone how to solve the Middle East in one evening of chit chat! No one pretends to be that wise! Good! At heart it has an overt message that feels utterly correct--not a solution to Isreal's policies but a wise recipe for finding some kind of solutions. Simple, but true. Listen to one another. Talk. Scream if you must. But most of all, listen. Okay, bravo a thousand times for that! Really. Cannot say that enough. 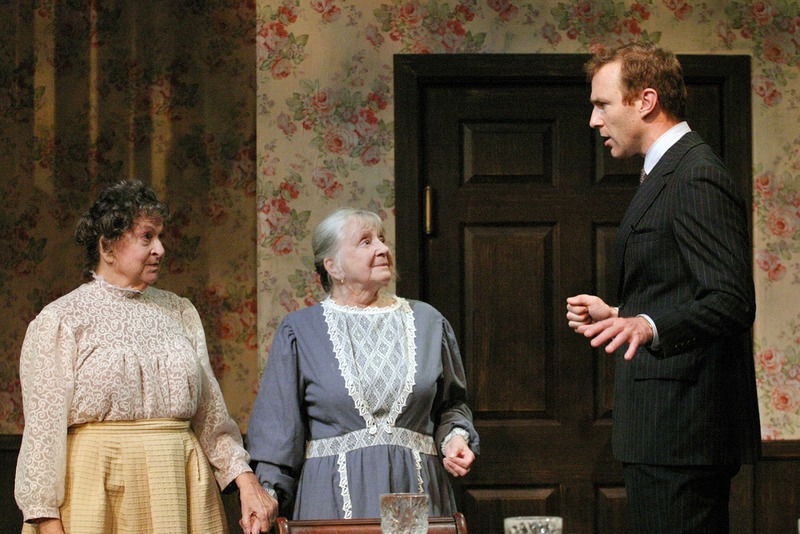 The play deals with a nice mixed family in the Midwest, just in time for Passover 2007. Wisely (or foolishly, not quite sure which) author/director Gary Lamb (nice man, met and chatted with him) avoided the bitterness of the last year or so. Lauren (Saige Spinney) is wed to David (Richard Van Slyke) and because he married outside the faith some Jews don't regard their children as Jewish. Their teenage son Adam (Adam Simon Krist) comes across as something of a slacker, eclipsed by the brilliant older sister Sarah (Julie Lanctot) who's away at Stanford University but is expected back any time now. Roz (Cynthia Kania) is David's mom, still dealing with her widowhood. When Sarah does show up, she's donned a full Muslim chador, saying nothing at first to see how each of them react. A school project she says. They aren't happy about the stunt, feeling more puzzled than anything else. Okay, she admits, it isn't a project for a class. She wanted them to get ready to meet her boyfriend who'll be here soon. Jamal (Luke King). Is he Muslim? No, but he is black. And they all feel genuinely puzzled she'd fear their reactions. Jamal arrives, and they are much more put off by the fact he's nine years older than Sarah and a Graduate Assistant in one of her classes--in other words, technically he's one of her teachers. 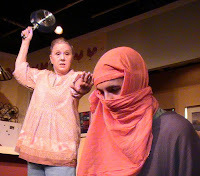 Not until Act Two do we learn not only are Jamal and Sarah engaged, but that Jamal's mother is Palestinian. Then the fur flies! Okay, all well and good! I like this! A natural set of conflicts just waiting to get entangled without any final resolution but explored in such a way as to offer insight! But...I have two complaints and they really do interfere with any appreciation of the show. Both involve the script. And you yourself may regard this as a matter of taste. First seems like this play takes few risks. I never feel this family and their love for each other was ever going to snap or break apart or even metaphorically bleed. In other words, the stakes never seemed terribly high. The absolute worst that might happen might have been a temporary rift between Sarah and her parents, which would heal within a couple of years at most. Second, much of the meat of the play involved no subtext at all. Chunks of dialogue were written "on the nose" with no underlying tensions hinted at, no deep issues at play, etc. So we have some conversations, a little heated but nothing too dramatic, with folks more or less agreeing on basics while avoiding anything really nasty. As a result, I felt like I've eavesdropped on some nice people talking about important things, coming to one very vivid and correct conclusion with which I agree, but who do so with little drama and never really exploring the bloody meat of the subject. 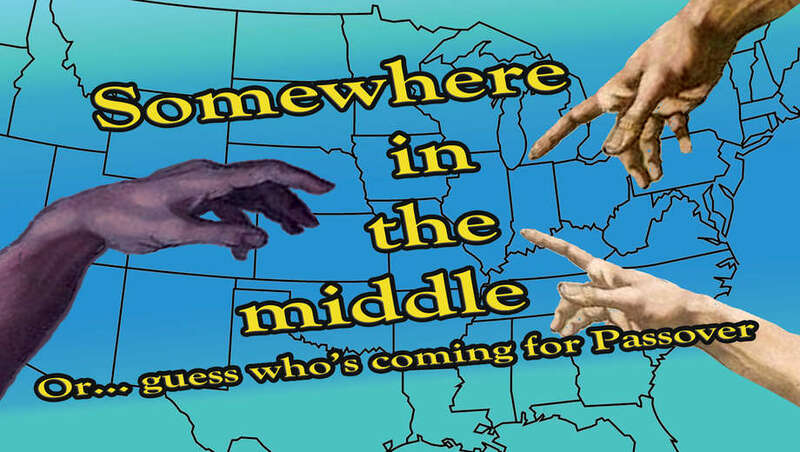 Somewhere in the Middle plays Fridays and Saturdays at 8pm, Sundays at 3pm through October 8, 2017 at the Crown City Theatre, 11031 Camarillo Street, North Hollywood CA 91602. 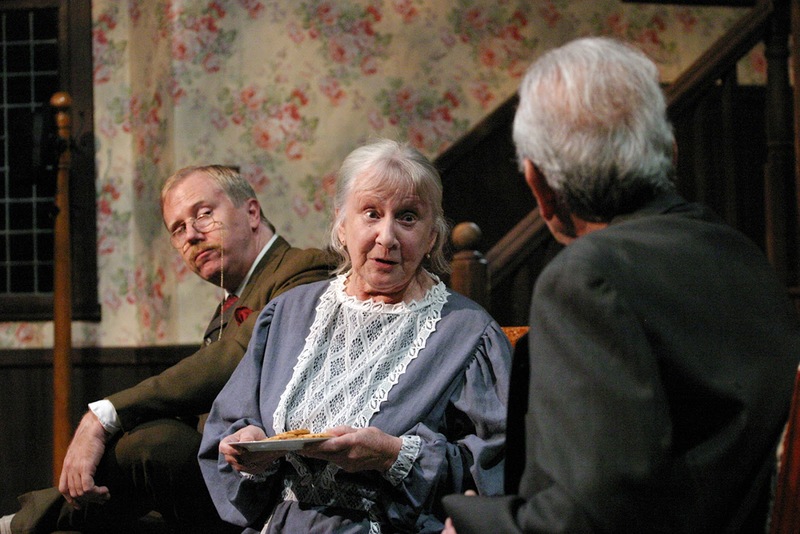 Productions of Arsenic and Old Lace face a problem. Quite simply, this very popular play had a very successful, very funny film adaptation starring Cary Grant. Yeah that makes for a lot of time to use the word "very." More importantly, it creates a temptation to "copy" that film at least in terms of style (which was really quite over the top zany). Odyssey Theatre's production thankfully tries no such thing. Instead of orchestrating a series of ever-wilder gags in a rising crescendo of silliness, it grounds the humor in real moments between characters rather than perfectly delivered gags. Of course the two need not be mutually exclusive, which highlights the biggest problem with the production. It just is not as funny. "As" funny, please note. We the audience still laugh. But mostly we grin and enjoy the plot and characters. Is this a problem, though? 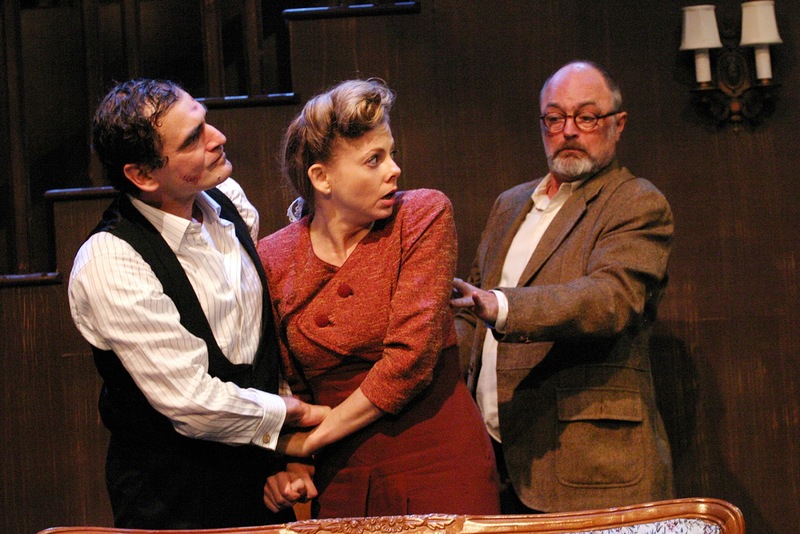 Essentially the play focuses on the Brewster Mansion in Brooklyn during World War II. It stands next to a cemetery, and only recently had electric lights put in by the sweet elderly spinster sisters Abby (Sheelagh Cullen) and Martha (Jacque Lynn Colton), renowned throughout the neighborhood for their good works. A nephew named Teddy (Alex Elliott-Funk)--who believes himself to be Teddy Roosevelt--lives with them, the kind of lunatic most folks seem willing to affectionately tolerate. Another nephew, Mortimer (JB Waterman), is a theatre critic for a major newspaper and is dating the local minister's daughter Elaine (Liesel Kopp). Of course we learn fairly soon the dear old sisters are in fact serial killers (although the term hadn't been coined yet). They poison lonely old men who have no family when the latter coming looking for a room. A mercy killing, one of their charities, you see. Then Teddy buries the "Yellow Fever Victim" in one of the locks of the Panama Canal, i.e. the cellar. Twelve so far. Mortimer as one can imagine is hardly happy to discover all this. He loves his aunts, and his brother Teddy. But cannot allow this to continue (although honestly Z and X cannot imagine what his problem is). All this becomes even more complicated with the long lost nephew Jonathan (Gera Hermann) returns in the middle of the night, a professional criminal and violent psychopath with his pet plastic surgeon Dr. Einstein (Ron Bottitta) in tow. Given the set has five different exits (which are also entrances of course) it should surprise no one the complications build on complications, secrets are kept then discovered, then new secrets and situations pop up amid a growing threat of violence--all with a light touch. The script really does stand out as a near masterpiece that way. To do a farce like this somewhat low-key makes for a fascinating choice, skillfully done. A simple example stands out. Teddy spends the first scene not strutting about in a caricature of Teddy Roosevelt, but rather hovering and acting on impulse rather like a child playing make believe. He and the rest of the cast never ape their facial expressions, don't distort themselves into caricatures of human behavior. It would be so easy to do that! Yet by not doing it dozens and dozens of little details stand out, little bits of characterization one rarely sees in a farce--but which deepens the humor, while at the same time making the laughs quieter. A really interesting set of choices, so consistent director Elina Santos deserves credit for it. 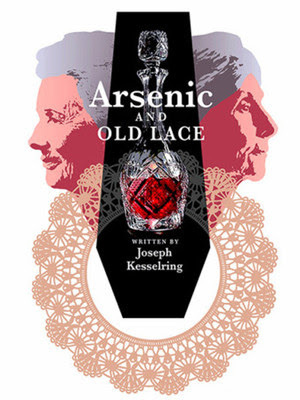 Arsenic and Old Lace plays Fridays and Saturdays at 8pm, Sundays at 2pm (with one Wednesday Sept, 13 and two Thursdays Sept. 28 and Oct. 5) through October 8, 2017 at the Odyssey Theatre, 2055 South Sepulveda Blvd., Los Angeles CA 90025.